Project OpenBook is an experiment in doing good. 60% of kids in poverty don’t have a single age-appropriate book in their homes. * When we launched MarbleSpark, we had a crazy dream that maybe, somehow, we could put a small dent in that statistic. But we needed a book we could give away without going out of business. And not just any book… We needed an awesome book. So we decided to build it. Not only that, we decided to ‘crowdsource’ it. We’ve always been big fans of Shel Silverstein’s kid’s poetry. It’s a great mix of funny, thoughtful and mischievous. And the nature of a poetry compilation — short, bite-size poems each with its own illustration — made it perfect for a community-built book. So we put out a call for submissions. And we harassed everyone we knew. We got poetry submissions from all over the world, from all ages and walks of life. And we convinced some truly amazing artists to help us illustrate the poems. 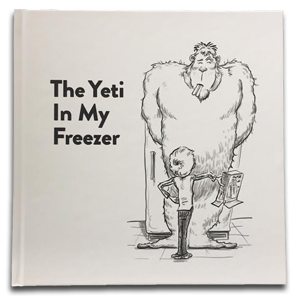 And the result was a book of children’s poetry called The Yeti in My Freezer. 2016: Finished The Yeti in My Freezer. 2017: First book-drop! Donated 1,000 books. 2018: Second book drop! We were featured in the news. Donated 500 books. Third book drop! Author visit to our son’s 1st grade class. Donated 100 books. Fourth book drop! Our books made it across the globe with the help of Educate Uganda. Donated 100 books. Giving Tuesday – Placed copies of ‘Yeti’ in random places around Omaha to share the love of reading! 50 books. Fifth book drop! Donated 1,000 books. 2019: Sixth book drop. Donated 165 books. This is a journey and we’re still learning! We will continue to update this page as we get smart about giving away books to kids in need.